This is the Official Website of the Livingston County, Kentucky Government. 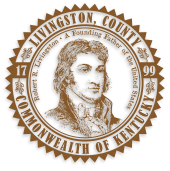 This website provides information for residents and visitors to Livingston County on all matters of local government. If you have questions about Livingston County please look through the site and direct your questions to the correct department. If you can't find what you need, contact us using our Online Contact Form. The courthouse and offices are open Monday through Friday, except holidays, 8:00 a.m. to 4:00 p.m.